What better folk to help us wave goodbye to the Jubilee summer than the Pearly Kings and Queens of London town? Crowds of Pearlies and spectators from all corners of London will gather for the annual Harvest Festival in the City of London this Sunday. Over 150 years on from when road sweeper Henry Croft covered his finest whistle and flute in shiny white buttons and embarked on the first of many charitable ‘whip rounds’ for the city's poor, modern day Pearlies continue with their own charitable mission. Guildhall Yard will host an afternoon of spirited celebrations of the summer’s bounty with Dickensian costumes, Morris dancers and maypoling mayors. Kick and prance along to the jaunty sound of pipes and marching bands. The spruced-up sovereigns will then parade their way down to a colourful service at St Mary-le-Bow church, home of the renowned Bow Bells. You may have to have been born within earshot of the bells to be considered a true cockney, but Sunday’s festivities are a great excuse for the rest of us to pretend. 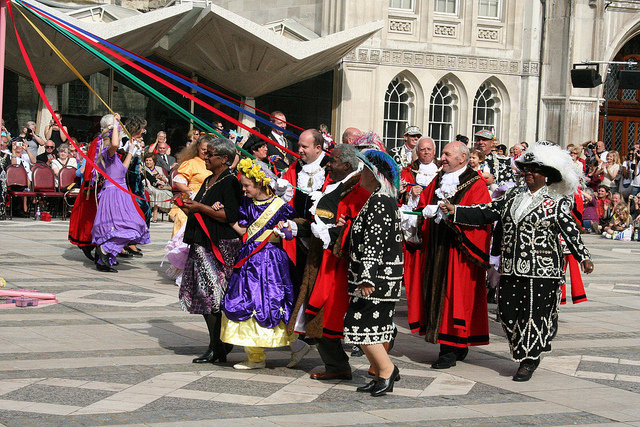 The Pearly Kings and Queens Harvest Festival takes place Sunday 30 September, starting at 1pm at Guildhall Yard, with the service at St Mary-le-Bow Church beginning at 3pm. Admission won’t cost you Ken Dodd and all donations from the day will be given to the Whitechapel Mission. By Jodie Shepley. Photo by IanVisits via the Londonist Flickrpool.